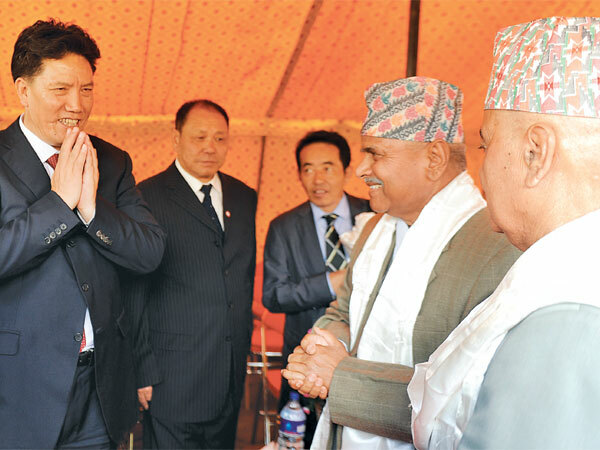 Chairman of the Government of the Tibet Autonomous Region of China Luosang Jiangcun (left) greets President Ram Baran Yadav (2nd right)and Vice-president Paramananda Jha (right) at a tea party organised at the Vice-president’s office in Kantipath, Kathmandu, Nepal. (TibetanReview.net, Oct30, 2014) – Leading a delegation of six-members from Oct 27 to 31, the Chairman of the Chinese government in the Tibet Autonomous Region Mr Luosang Jiangcun has called on Nepal to curb alleged “anti-China activities” in the country while also discussing further strengthening of measures to prevent unauthorized cross-border movement of Tibetans. He also announced increased Chinese aid for Nepal. The discussions took place during meetings with Nepal’s Minister for Foreign Affairs Mahendra Bahadur Pandey, President Ram Baran Yadav, Prime Minister Sushil Koirala, Deputy Prime Minister and Minister for Home Affairs Bam Dev Gautam, Deputy Prime Minister and Minister for Federal Affairs and Local Development Prakash Man Singh and Minister for Culture, Tourism and Civil Aviation Dipak Amatya. Nepal’s ekantipur.com Oct 28 quoted officials as saying the Chinese Tibet delegation head repeatedly mentioned “anti-Chinese elements” during talks with DPM Gautam and minister Pandey. “He urged us to curb anti-China activities and take stern action against those involved in such activities,” Laxmi Prasad Dhakal, spokesman for the Home Ministry, was quoted as saying. Luosang was also reported to have sought better coordination and communication among security agencies on both sides of the international border to curb such alleged activities. He has sought to drive home Beijing’s long-standing position that “China doesn’t have any refugee as such” and those crossing the border into Nepal are illegals. The report cited both the ministers as having assured Luosang that the Nepali soil would not be used against its neighbours. Nepal’s niticentral.com Oct 28 also cited Dhakal as saying the two sides agreed to take effective measures to strengthen border security during the talks. The meeting with Deputy Prime Minister Prakash Man Singh was reported to be expected to focus on Tibetan assistance to 15 northern districts of Nepal bordering Tibet, including with essential supplies and funding of some infrastructure and social projects. Luosang announced an additional 20 million yuan annual aid to Nepal over five years during his meeting with Prime Minister Koirala on Oct 28, reported ekantipur.com Oct 29. The report noted that China had been providing 200 million yuan to Nepal as annual support to execute various projects and another six million yuan for security equipment, while EXIM Bank of China had been providing 154 million yuan for construction of two transmission lines, 200 million yuan for setting up an Academy for Armed Police Force and 50 million Yuan for 15 northern districts of Nepal. Luosang was also reported to have pledged to donate 100 desktop computers to the UCPN-M during his meeting with the party chairman Pushpa Kamal Dahal, creating a bit of a controversy. The thehimalayantimes.com Oct 28 said this could set a bad precedent for other countries who could also extend such assistance to political parties bypassing the government. It cited Gopal Bahadur Thapa, former Chief of Protocol at the Ministry of Foreign Affairs, as saying said such assistance should be provided with the consent of MoFA or at least MoFA should be notified in advance about such gestures. The delegation is also visiting Lumbini and Bhaktapur before flying back to Lhasa on Oct 31.